Take a moment, next time you are in church, and look around. Look around on Sunday morning. Look around on Sunday night. Look around on Wednesday night. Look at the people present. Think about those who are missing and consider this: without them, there would be no church. The body of Christ is made up of all kinds of people. They range from newborns to those who have a vast amount of life experiences. What many seem to forget is that simple statement that you read two sentences ago: without them, there would be no church. The kids are too noisy. The adults are too old fashioned. The music is too slow. The music is too fast. They don’t dress right. They dress too formal. Blah, blah, blah, blah. We are the body of Christ, and it’s about time we start acting as such. That begins with loving each and every person who enters His house. Lord, help me understand that I am just one part of the body of Christ. Help me see that everyone, child through adult, are necessary for the growth and edification of the body of Christ. 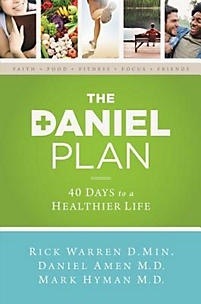 The Daniel Plan: 40 Days To Healthier Life, Rick Warren, Daniel Amen and Mark Hyman, authors, is a book dedicated to guiding Christians into becoming healthier as they grow into a deeper relationship with God. This 40 day adventure is the brainchild of pastor Rick Warren of Saddleback Church in Lake Forest California. Warren became a household name after writing the Book entitled The Purpose Driven Life. This current publication follows a similar thought in that after following a program for 40 days a change in habits can occur, thus a changed life. While this book presents a good program that is easily followed, there are some concerns for the amount of money that will be spent on the diet specific foods that need to be purchased, but in the end the results will far outweigh the cost. This publication offers a unique approach to healthy living and spirituality, thus it is a recommended purchase for those seeking to lose more weight and gain more of God. 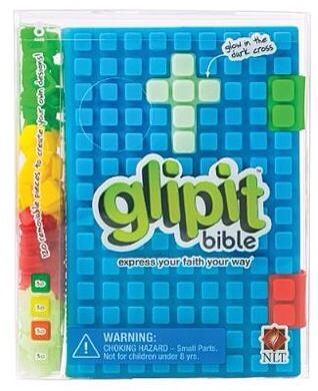 The Glipit Bible: Express Your Faith Your Way, published by Tyndale House Publishers, is a Bible that allows its owners to uniquely express themselves as they are afforded the opportunity to design, with limitations, the Bible’s cover. This Bible, published in the New Living Translation, is uniquely fantastic. It brings forth a powerful translation that is easily understood, but it also presents a cover that can be customized by young Christians who are blessed to buy or receive it as a gift. The Bible is small enough to be carried or placed within a backpack or knapsack. The bright and colorful cover will remind the little tikes of their legos system in structure, but with a soft rubbery feel. The one I was sent for review came with a glow in the dark cross, and 120 single pieces in groups of 30 of each of the following colors: green, red, yellow and glow in the dark. Also included were two red clasps to hold the Bible closed. This Bible will bring joy to the little heart of the one who is lucky to receive the blessing of its presence within their lives, thus it is a highly recommend purchase. Isaiah 9:6 For to us a child is born, to us a son is given,and the government will be on his shoulders. And he will be calledWonderful Counselor, Mighty God, Everlasting Father, Prince of Peace. What is God to you? In speaking of the arrival of Jesus, Isaiah paints a beautiful description of who was to be anticipated. Among the four descriptions, Jesus was to be called Everlasting Father. Those two words describe something so wonderful that it is almost beyond words. People come and go from our lives, but God will never leave. God will be the only true constant within our lives. He will be our rock, our fortress, our shoulder upon which we can always cry. He is and always will be our Everlasting Father. Lord, help me come to never doubt Your presence within my life. Help me constantly reach for You and embrace the life You have planned for me to live. NIV Essentials Study Bible: Easily Grasp The Essentials of God’s Word, published by Zondervan, is another spectacular Bible that is designed to enhance your study of God’s Word, thus enhancing your Christian witness. 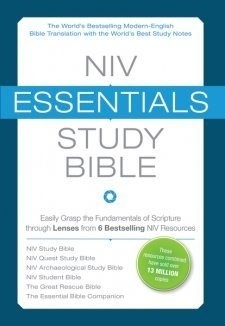 As the name implies, the NIV Essentials Study Bible contains the essentials, the highlights, the best of the sidebars, footnotes, and study aids from six of the best selling NIV resources: NIV Study Bible, NIV Quest Study Bible, NIV Archaeological Study Bible, NIV Student Bible, the Great Rescue Bible and The Essential Bible Companion. These six resources are utilized to bring together nine powerful study aid lenses. Flyover Lens: The Essential Bible Companion, the Unpack lens: NIV Study Bible, the Dig Deep, Look Close Lens: NIV Archaeological Study Bible, the Question & Answer Lens: NIV Quest Study Bible, the Important People In Focus Lens: NIV Student Bible, the Guided Tour lens: NIV Student Bible, the Insight Lens: NIV Student Bible, and the Reflect & Respond Lens: The Great Rescue Bible. These six resources, brought along the side of the popular NIV translation, offers what can only be termed as an unprecedented resource for the student of God, thus this is a recommended purchase by those who are serious about their study of God’s Word. Sometimes it can become difficult to follow Jesus. For as we are bombarded with the realities of life, we have a tendency to quiver, even if in the slightest ways. Sometimes, as we are enduring the circumstances of life, God seems very far away. When we feel this way, we must wholeheartedly embrace the words of Jesus we read a moment ago. Even though Jesus is not physically present, He is spiritually present within all of those who have sought His face, repented of their ways, received forgiveness through baptism, and begun their walk with Him. So even though He may seem distant, even though we may feel alone, He is ever present within our lives. Lord, help me feel Your presence every day, especially when You seem to be so far away. What does tomorrow have in store for our lives? This question is becoming more and more concerning as our society travels through the many current difficulties and those anticipated to arrive in the future. The surety that existed at one time, the surety of employment, the surety of a good life, these have somewhat faded for many people. So what is there to be excited about? What is there to look forward to in the future? Not to sound too cliche, but the answer is God, eternity with God. Simplicity of life was never promised. They say the only two guarantees in life are death and taxes. Well, to that we must add two more. The only assurances in life are death, taxes, the presence of God, and the reality of eternity. Here on this earth, we must deal with each day as it arrives, but we do not have to deal with them alone. God will walk with us now and for all eternity if we allow Him to be Lord of our lives. What does tomorrow have in store for our lives? Nobody really knows. But as long as God is there at our side, everything will come out just fine. Lord, walk with me today. Make me stronger, more focused, ready to deal with anything that comes along. Matthew 1:23 The virgin will be with child and will give birth to a son, and they will call him Immanuel which means, God with us. Today is a glorious day. Today we celebrate the birth of our Lord and Savior, Jesus. Today we celebrate His entrance into this world and His entrance into our lives. Today we will celebrate with the exchanging of gifts, the eating of a glorious meal, and the spending of time with family. Some will not be so blessed. Some will be sitting alone not enjoying their solitude, not enjoying the “Holiday.” How can one celebrate alone? How can one enjoy such a glorious occasion in solitude? Can there be an answer to these questions? Yes, of course, there is an answer. For those of us that are blessed, let us spread the blessing by being a blessing in someone’s life. Make a phone call. Send a plate of food. Drop off a small gift. Offer an invitation to dine with you and yours. In others words, take a moment today to bring some joy into someone’s life. Lord, help me share Your love today with someone who needs even a moment of my time. John 6:40 For my Fathers will is that everyone who looks to the Son and believes in him shall have eternal life, and I will raise him up at the last day. What do you put your trust in most each day? The simplicity of this question does not exist, for throughout each day we place a great deal of trust in numerous things, objects, and/or people, and we do so in most cases without much thought. We place our trust sometimes so callously, so void of thought, that we are surprised when the outcome is not as we expected. Trusting others is necessary. Trusting others is important. Trusting in certain things is a necessity, but our greatest amount of trust should be placed in God. Our focus must be on trusting God. For those of us willing to trust in God, for those of us willing to look to Him for guidance, for those of us willing to believe in Him, for those of us willing to give our lives over to Him, shall be granted eternal life. Lord, allow me to live for You today and every day forward. Help me spread Your love and Your mercy within this world. Psalm 93:2 Your throne was established long ago; you are from all eternity. The debate over the age of the earth can, at times, become pretty harsh. There are varying opinions, ranging from 10,000 years to millions and millions. We can get into the difficulties and/or concerns about carbon dating. We can dive into the Biblical scriptures that show dinosaurs existed along side man. We can even discuss reasoning behind fossil placement following the flood. The problem is this: does any of that matter as much as the presence of Him who existed from the beginning, His presence within our lives? God’s throne existed from the beginning and will continue for all eternity. He will reign forever and ever, and, as His children, we should honor Him with our service. Lord, let my life be an expression of my gratitude and adoration to You.